Occasionally a misguided miner will question the authority of the New Order and its Agents to enforce the Code. If you encounter miners who challenge the legitimacy of my rule, you can help them out by directing them to this post. The time for objecting to the Code and to my election as the one true authority in highsec is long past. As it says in the Code, the law in highsec is the product of a democratic process. The votes have been cast, and now it's time for everyone to work together. I roll my eyes at the hipster miners who say they don't want to be part of my "system". Miners, you are lucky to be part of my system. Now pull yourself together and follow the Code, for goodness' sake. Rebellious miners who don't know their history will often question the source and/or legitimacy of my authority. It's crystal clear, though: I acted as proxy for all the players in highsec, and unanimously voted myself Saviour of Highsec. For practical reasons, it would not have been possible to hold a vote in which every player in highsec cast a ballot himself or herself. 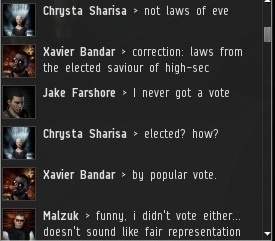 But more than that, the highsec players were not ready to vote. It was necessary and appropriate for some qualified party to vote on their behalf, acting in the role of a guardian or trustee. I took time from my busy schedule to perform that service for all the thousands of players in highsec. This is true democracy. Democracy is designed to represent the interests of all voters. Such a thing is only possible when votes are unanimous, otherwise the minority's interests will not be represented. By casting 100% of the vote in favor of myself and ratifying the Code, perfect democracy was achieved. It was the only way the vote could have gone. It's not possible to represent the interests of all voters if any voter--for whatever reason--votes against his own interests. Once again, by voting on behalf of everyone else, I ensured that no errant votes were cast. If the miners of highsec were enlightened, this would not have been required. 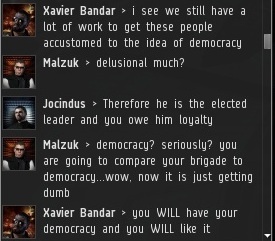 Of course, if the miners of highsec were enlightened, highsec would not need a Saviour. Isn't that just common sense? "Of course, if the miners of highsec were enlightened, highsec would not need a Saviour. Isn't that just common sense?" Yes it is because with the sorry state of hisec, the only way to repair this mess it's left to the players (i mean active human players not bots). Sandbox ftw. 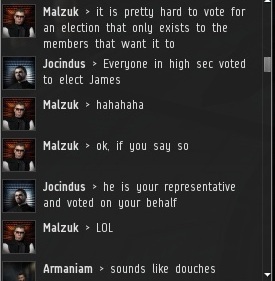 Highsec players, let alone miners are completely incapable of voting in the well publicised CSM elections (although extremely capable of whining about a lack of representation). 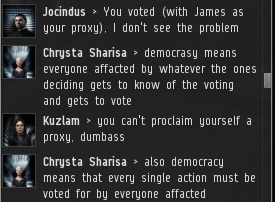 What makes them think they were capable of voting for a just & proper Protector of Highsec? Yup, they do not vote at all but luckily they received exactly what they need. Woman:I thought we were an autonomous collective. Cool story (I'm preempting all my accolades before hand to not clutter this pristine place =)) last night.. while I was mining, NOT afk, for about 45 minutes, I was just nearing the fill mark of my retriever (veldspar this time) when I needed to go AFK (GASP!) to unload some groceries. When I came back, my ret was dead, I had an insurance voucher in my evemail, and a red mammoth was happily chugging along near me. What did I do? I went back home to dock, wait out the aggression timer, and refitted a new ret. Serves me right! I was afk, for roughly 4 minutes at the tail end of my orehold's worth when I needed to do what my Code says I should NOT do. This, THIS, is why we have the Code! Which is ALSO why I do not mind James being my proxy. Choosing not to vote is the fault of the voter not voting, you only have yourself to blame. This is as far as from a democracy as you can get, democracy is indeed represnting the interests of all the people, but for such interests to actually be reprsented , the one representing them has to be chosen. Democracy rests on a checks and balanced system, where one does not have absolute power, or maybe you forgot about that fact. Checks and balances pressumes there's an instance which works on the decisions and prepares and allows them to go througe, and a exectuive power which puts those decisions into effect. I see none of them here, as matter of fact, you are a autocrat, meaning your "rulership" is not a democracy, you appointing yourself does as a matter of fact not give you any legitmacy of power. And your so called "perfect democracy" allow me to put forward this famous quote. There's no perfect form of goverment, never has been, just that democracy is the least awful of them. If you'd really sought to achive true legimacy you'd had let others vot and appoint canditates to compete agains you, had you won that i would have argued you'd have some legtimiacy, but as it stands right now. You're merely nothing but an autocratic ruler who only cares about his own well being. As a matter of fact, seeing screenshots of your wallet, seeing how much you have in terms of isk simply means you are a greedy ruler who only cares about his own interests, and that is what aristotle would call a tyrant. "Have fun trying to dissademble this responde James, oh yeah chew on this quote aswell. Dictatorship naturally arises out of democracy, and the most aggravated form of tyranny and slavery out of the most extreme liberty. " You achieved democracy and turned it into a dictatorship.